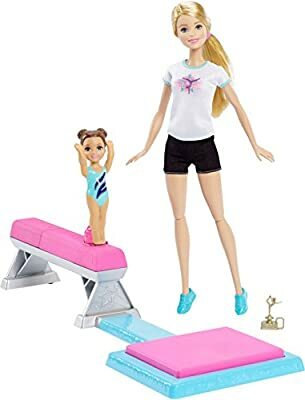 Explore the reward of teaching gymnastics with this Barbie play set that young gymnasts will flip for -- Barbie doll teaches her toddler student to perform an amazing balance beam dismount! The set includes everything to jumpstart the fun: Barbie doll, a toddler student doll, a balance beam, landing mat and golden trophy. Play is easy. Activate the balance beam before the toddler hops on by pulling back on the lever. Then place the toddler doll on the pink balance beam. The balance beam will launch the toddler doll into the air with the press of the button so she can perform an amazing flip and then execute an award-winning landing on the mat -- magnetic technology helps to ensure she sticks the dismount almost every time! A golden trophy is a fabulous way to reward her hard work. Barbie doll is ready to coach her gymnastics protégé in a t-shirt with gymnast graphic, black shorts and sneakers; the toddler doll is adorable in a colorful bodysuit (non-removable). Young athletes and aspiring coaches will love creating balance beam routines! 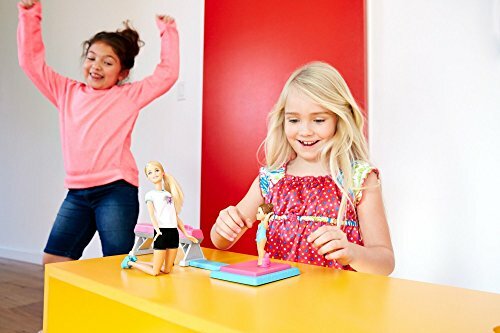 Play set includes Barbie doll wearing fashions and accessories, toddler doll in non-removable outfit, launching balance beam, magnetic landing mat and gymnastics trophy. Barbie doll cannot stand alone. Colors and decorations may vary.